Confidence always begins in the safety of making good decisions, and the best demonstration that our products withstand the ravages of time and use is with a 10-year guarantee for profiles and components. A Lasting Quality guarantee backed by the most prestigious national and international certificates. 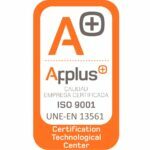 02 The ISO 9001 certificate is the most internationally recognized regarding the quality of industrial processes and procedures, from manufacturing to customer satisfaction. 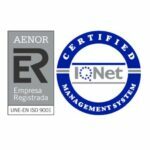 AENOR, the leading entity in the certification of management systems, products and services, and responsible for the development and dissemination of the UNE standards is the one that certifies Nevaluz Sevilla SL with its seal of quality and the CE marking as manufacturer of the European Union. 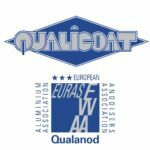 Qualicoat is the most prestigious seal regarding the quality of paint and industrial lacquer. All the paints used in the manufacture of Sahara products have passed laboratory tests to obtain this seal. Likewise, the Qualanod seal guarantees the quality of the anodized. There are also options for Super Durable paint that resists saltpeter and rust with greater longevity, ideal for places near the coast. Sahara guarantees all its products for a period of 10 years, from the date of delivery of the material to its Official Distributor. All intermediaries between the distributor and the final consumer have to notify the defect to their direct supplier. Only documented claims with proof of purchase of the Sahara system presented within the term covered by the guarantee are accepted. The Sahara products are designed, tested and manufactured by Nevaluz Sevilla S.L. and its use is exclusively directed to sun protection and rain protection. The warranty covers all complete systems (installed) and accessories supplied by Sahara. The accessories are CNC-machined aluminum accessories, aluminum profiles or sheet metal supplied by Sahara. As well as, Sahara systems mounted according to the steps indicated by Sahara.